At least 283 people are listed missing nine hours after the 6,825-tonne passenger ferry Sewol capsized off the coast of Jindo Island, in the southwest of the Korean Peninsula. The Sewol, which was carrying 462 passengers including 30 crew issued a distress call at 8:52am local time before tilting to its side and capsizing at around 11:30am. The vessel departed from South Korea’s western port city of Incheon on Tuesday night, carrying 325 students and 15 teachers on a 14-hour school trip to the southern resort island of Jeju. 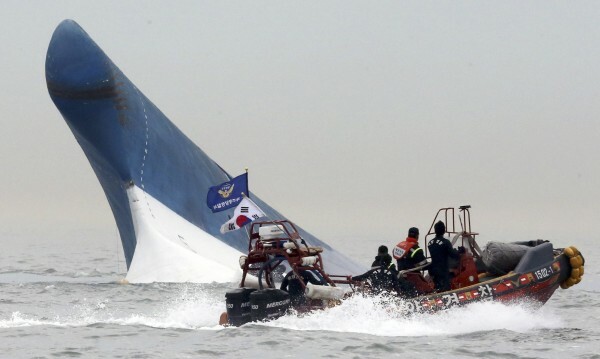 South Korean naval authorities said they were able to rescue 174 people, 78 of whom were students. At least 55 people were taken to hospital for minor injuries. Rescuers fear that many passengers may have survived but are trapped below deck. Although 87 vessels and 18 aircraft have joined the rescue mission – 180 divers are in the waters around the Sewol, strong currents made approaching the ferry difficult as muddy waters significantly lowered visibility on Wednesday night. Rescue operations are set to resume at 1am local time. Survivors told South Korean TV that the Sewol took a different route than normal because it left port more than two hours behind schedule. They said they heard a ‘thumping’ sound shortly before the distress call was made – raising fears the ship may have run aground.